Size: 3.8" x 8.0" x 1.0"
You’ll find an expansion port to install either RAM or ROM-cartridges and you may connect a printer PC-324 to the calculator. Already without any expansion the TI-95 features up to 8 kByte of memory, the expansion adds another 8 kByte. The display uses a 5*7 dot matrix instead the normal 7-segment design to give full alphanumerical capability. A close relative to the TI-95 PROCALC, the TI-74 BASICALC explains the typewriter style keyboard. In 1987 Texas Instruments introduced Programmable Calculator News, a service for TI-74 and TI-95 users to feature program listings, technical articles, question and answer segments, new product reviews, and user comments. All Programmable Calculator News are available for free download as a service provided by the Datamath Calculator Museum. CPU (Central processing Unit): The Texas Instruments TMC70011 microcontroller is a member of the TMS7000 family manufactured in CMOS technology. 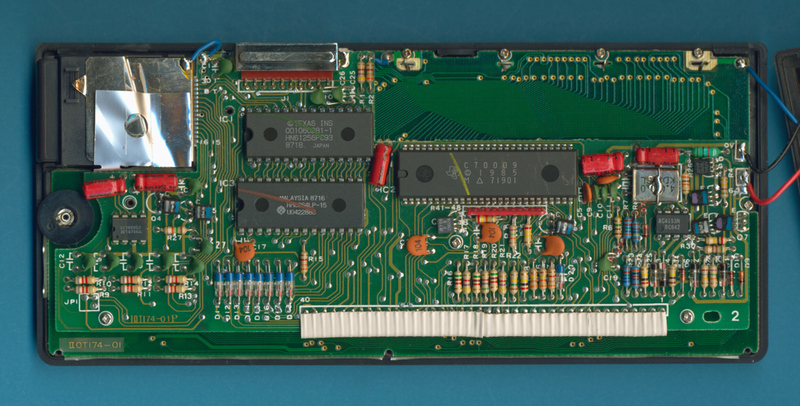 The original design of the TMS7000 series was introduced in 1981 as an 8-bit extension of the TMS1000 Familiy to compete with the Intel i8051, Motorola M6801, and Zilog Z8 parts. The first chips sported 128 bytes of on-chip RAM (Random Access Memory) and either 2k Bytes or 4k Bytes of ROM (Read Only Memory). Later versions, e.g. the TMS70C46 found in some TI-74 BASICALC computers featured 256 bytes of RAM. ROM (Read Only Memory): The ROM contains the operating system of the calculator or computer. The first products on the market used mask-programmable ROM, the program was strored already during the production of the Integrated Circuit. Later calculators changed to Flash ROM, a technology allowing the programming of the software during the final production stage of the calculator. With the TI-83 Plus and all later graphing calculators from Texas Instruments even the user was able to reprogram the operating system. The HN61256 ROM of this TI-95 PROCALC was manufactured by Hitachi and offers a capacity of 32k Bytes. RAM (Random Access Memory): The RAM is used as data memory and is used to store both variables, user programs and intermediate results. 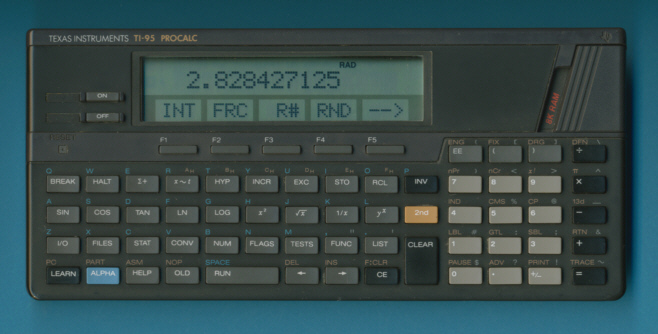 This TI-95 PROCALC makes use of HM6264 manufactured by Hitachi, Japan. The capacity of the memory is 8k Bytes. DISPLAY: The display electronics of the TI-95 PROCALC uses a combination of the Hitachi HD44780 dot-matrix LCD controller with 40 segment and 16 common drivers and one Hitachi HD44100 driver supporting 40 additional segments. It took only 4 years till Texas Instruments introduced with the TI-81 their first Graphing calculator and another 5 years to the unbelievable TI-92. If you don't own a TI-95 calculator - emulate it!